Skåne County (Swedish: Skåne län), sometimes referred to as "Scania County" in English, is the southernmost county or län, of Sweden, basically corresponding to the traditional province Skåne. It borders the counties of Halland, Kronoberg and Blekinge. The seat of residence for the Skåne Governor is the town of Malmö. The headquarters of Skåne Regional Council is the town of Kristianstad. The present county was created in 1997 when Kristianstad County and Malmöhus County were merged, and it covers around 3% of Sweden's total area, but its population of 1,250,000 comprises 13% of Sweden's total population. Prince Oscar of Sweden is Duke of Skåne. 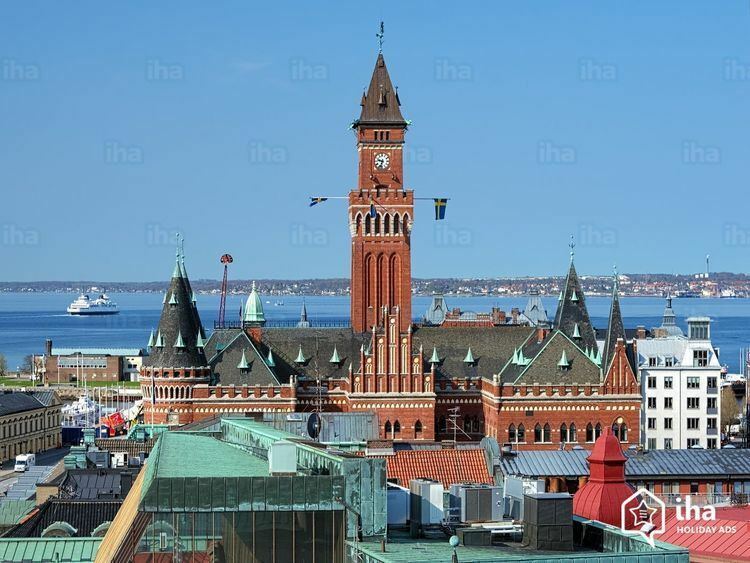 When the new county was established in 1997, it was decided to name it after the historical province Skåne so it was given the name Skåne län. The most common name used in English is Skåne County, even if the form Scania County occurs. It cannot be considered wrong to use either form in English. The coat of arms for Skåne County is the same as for the province of Skåne, only with the tinctures reversed and the crown, beak and tongue of the griffin in the same color. When the arms are shown with a royal crown it represents the County Administrative Board, which is the regional presence of (royal) government authority. Blazon: "Gules, a Griffin's head erased Or, crowned and armed the same". Skåne County is the administrative equivalent of the province of Skåne, but it also includes an insignificant part of the province of Halland. Skåne County is administered as Region Skåne, one of the 20 county councils of Sweden. Its main responsibilities are for the public healthcare system and public transport. In addition, it has for a trial period assumed certain tasks from the County Administrative Board. The two former administrative county councils of the province of Skåne shown on the map, Kristianstad County and Malmöhus County, which were established in 1719 were merged in 1997, forming the present county with boundaries that are almost identical to the boundaries of the province. The seat of residence for the Governor (landshövding) is the city of Malmö. The County Administrative Board is a Government Agency headed by a Governor. See List of Skåne Governors. Region Skåne is an evolved County Council, which was established in 1999 when the County Councils of the former counties were amalgamated. Its county or regional assembly is the highest political body in the region and its members are elected by the electorate, as opposed to the county administrative board, that guards the national interests in the county under the chairmanship of the county governor (landshövding in Swedish). Skåne County contains 33 municipalities (kommuner in Swedish), the largest by population being Malmö Municipality (301,000 inhabitants), Helsingborg Municipality (130,000), Lund Municipality (111,000 inhabitants) and Kristianstad Municipality (80,000 inhabitants). The municipalities have municipal governments, similar to city commissions, and are further divided into parishes. The parish division is traditionally used by the Church of Sweden, but also serves as a divisioning measure for Swedish census and elections. The county is divided into four parliamentary constituencies or electoral districts, electing 45 of the 349 members of the Riksdag. Each district is made up of one or more municipalities. The ten largest municipalities of Skåne County by total area. The motorway built between Malmö and Lund in 1953 was the first motorway in Sweden. With the opening of the Oresund Bridge between Malmö and Copenhagen (the longest combined road and rail bridge in Europe) in 2000, the Swedish motorways were linked with European route E20 in Denmark, and the two countries' railway systems were physically connected. Before the bridge was built there were train ferries operated between Helsingborg and Helsingør. There are also train ferries to and from Germany and Poland. Skåne has three major public airports, Malmö Airport, Ängelholm-Helsingborg Airport and Kristianstad Airport. One of the oldest airports in the world still in use is located in Skåne, namely Ljungbyhed Airport, in operation since 1910. Starting in 1926, the Swedish Air Force used the airport for flight training, and up until the military school was moved to the nearby Ängelholm F10 Wing in 1997, the airport was extremely busy. In the late 1980s, it was Sweden's busiest airport, with a record high of more than 1,400 take-offs and landings per day. The major ports of Skåne are Trelleborg, Copenhagen Malmö Port and Helsingborg Harbour. Ferry connections across the Baltic Sea operate from several smaller ports as well.